Summer officially begins tomorrow. As we celebrate the end of another school year and look toward planning our next couple of months, we offer this brief list of local festivals and family friendly activities for you to enjoy and keep you in the summer spirit. We also found a fun link to some great events happening in other corners of the State. So get out there and enjoy our great community. It truly is a fun place to call home. Have a safe and enjoyable summer! Yelm Prairie Days: Thursday – Saturday, June 21 – 23. The event kicks off with a parade on Thursday evening in downtown Yelm. Fun for the entire family with music, carnival, kids events and more. Greater Olympia Dixieland Jazz Festival: Thursday – Sunday, June 28 – July 1. This fun, upbeat annual event is held at The Worthington Center at St. Martin’s University, 5300 Pacific Avenue SE. There is a free outdoor performance at Olympia’s Farmer’s Market on Friday, June 29, 11:00 a.m.-1:45 p.m. Sponsored by the Greater Olympia Dixieland Jazz Society. There is an admission fee for the main venue at the Worthington Center. Washington state Senior Games: Friday – Sunday, July 26-29. Over 2,000 participants are expected to compete in a variety of both individual and team events from archery, basketball, soccer, ping pong and many more. Sponsored by Puget Sound Senior Games, please visit www.pugetsoundgames.com for more information and event schedules. Tribal Canoe Journey Landing: Sunday, July 29. More than 100 canoes from U.S. Tribes, Canadian First Nations, and other countries will land in Olympia to celebrate the ceremonial landing for the 2012 tribal canoe journey. 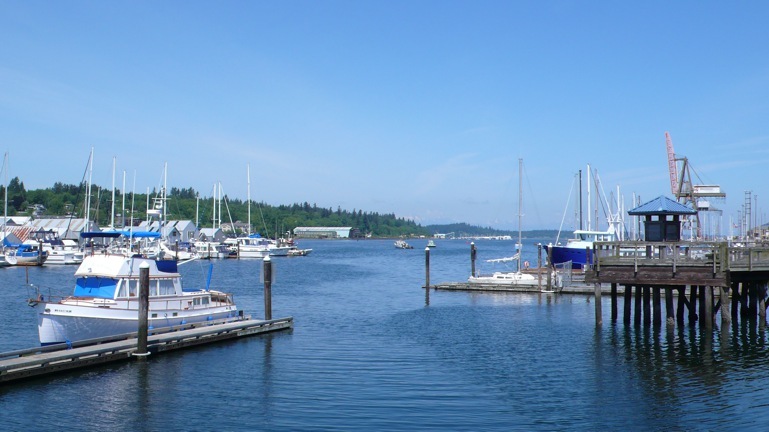 Hosted by the Squaxin Island Nation in cooperation with the City of Olympia and the Port of Olympia, the landing will take place at the most northern end of the Port of Olympia. Music in the Park: Wednesday evenings during August at Sylvester Park, downtown Olympia. Sponsored by the Olympia Downtown Association. Thurston County Fair: Wednesday-Sunday, August 1-5. For over 100 years the County Fair has hosted local 4-H kids, arts and crafts designers, exhibitors and more. Enjoy animals, food, entertainment, livestock shows, carnival and more. Visit www.co.thurston.wa.us/fair for event schedules, exhibitor information and more. Autism Awareness Walk and Festival: Saturday, August 11. This event will be held at Heritage Park, downtown Olympia. Sponsored by Autism Awareness Washington. Bon Odori: Saturday, August 18. Cosponsored by the Olympia-Kato City Sister City Association and the Japanese American Citizens’ League Olympia Chapter this annual event will be held on Water Street between 5th and Legion in downtown Olympia. Pet Parade: Saturday, August 18. This is the 83rd annual pet parade sponsored by the Olympian newspaper. Parade begins at 10:00 a.m. Time to dress up your favorite parade and enjoy a great day! Olympia Harbor Days: Friday – Sunday, August 31 – September 2. Celebrate tug boats and our maritime heritage at the annual festival sponsored by the South Sound Maritime Heritage Foundation. Arts and crafts, music, food, plenty of boats to view and tug boat races! Held on Percival landing and Columbia street in downtown Olympia. Visit www.harbordays.com for more information. Thinking of getting out of town for a day or two? Looking to explore outside of our area? The below link by “Top Events USA” provides information about festivals , fairs and celebrations across Washington state including Seattle, Lynden, Long Beach, Ellensburg and others. Previous post: Scholarship Winners! Congratulations!